There is a direct and frequent bus service (including Sundays) between Coventry, Coventry Rail Station, Warwick University, Kenilworth and Leamington Spa, which runs until late at night. Bus details are available from http://nxbus.co.uk/coventry/. O​n-campus accommodation is available via Warwick Conferences (​please note this isn't ​ student accommodation) - https://kxregistration.warwick.ac.uk/CAMRACON2018. Double rooms are £120.00 inc. vat per night double occupancy inc. breakfast and £99 inc vat, per night single occupancy. There are many commercial websites. showing accommodation in the area. e.g. 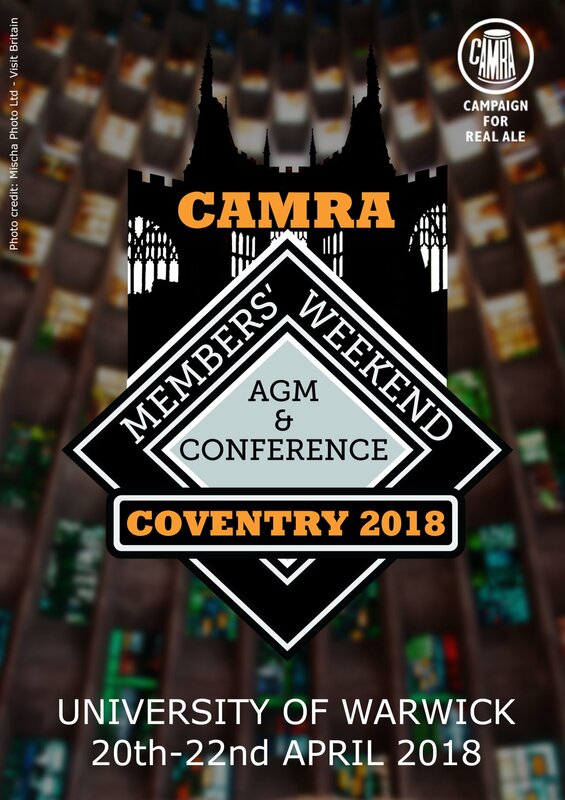 The following hotels have agreed reduced rates for CAMRA members attending the event, however CAMRA is not necessarily recommending any of these and you may wish to check​ on customer review sites. It may even be possible to get better deals through online booking sites. BRITANNIA HOTEL, which is in Coventry city centre and immediately opposite the bus station. To get these rates, the code WACV2004 will need to be quoted. You will need to book via moc.sletohainnatirb@htrowsob.yecats. Her direct line is 02476 633686. HYLANDS HOTEL, which is close to the railway station, and on the bus route to the university. Breakfast is not included in the price, but car parking is free. Please quote "Warwick University Conference". They have 3 different room types and offer standard rooms at £75, superior rooms at £95 and suites at £115 per room per night.